We’d love your help. Let us know what’s wrong with this preview of Until Tuesday by Luis Carlos Montalván. A highly decorated captain in the U.S. Army, Luis Montalván never backed down from a challenge during his two tours of duty in Iraq. After returning home from combat, however, his physical wounds and crippling post-traumatic stress disorder began to take t A heartwarming dog story like no other: Tuesday, a lovable golden retriever, changes a former soldier's life forever. To ask other readers questions about Until Tuesday, please sign up. I have read this book twice; one of the best books about the connection between a human and a dog. Wonderful. Any follow up expected? I recently read Tuesday Tucks Me In : See review which was the first time I’d heard about the author Luis Carlos Montalván and his service dog, Tuesday. After seeing that he co-wrote more books on Tuesday, I couldn’t wait to read more. Until Tuesday was just the book I was looking for to to gain insight into the relationship he built with Tuesday, while learning more about Luis and his experiences in the military and after. The book begins with Tuesday and describes his training and first few years of his life before he met Luis. He started his training at just 3 days old and spent time in a prisoner puppy training program as well as ECAD. Tuesday made bonds with a few different people that he had to let go. This made him sensitive and he'd developed issues with getting close to people. Luis, a captain in the U.S. Army, had multiple tours in Iraq and received awards including two Bronze Stars, the Purple Heart, the Army Commendation Medal for Valor, and the Combat Action Badge. During the time he was stationed at a border crossing at Al-Waleed, he was injured after an attack by two men that left him with multiple injuries including a traumatic brain injury. After 17 years of service he finally came back to the U.S., and he had a hard time adapting to civilian life. He was suffering from PTSD, anxiety, flashbacks, you name it. He also had a balance disorder that caused him to have horrible migraines as well as vertigo which resulted in easy falling. The trauma and violence of war were still upon him and the future was looking grim for Luis until he met a service dog by the name of Tuesday. Little did Luis know, Tuesday would help him live again. I couldn’t wait for the weekend so I could read this book uninterrupted. I DEVOURED it and it nearly tore my heart out. I was shocked at all Luis had been through and yet, he was still so courageous. He was relentless in giving to his country and wanted to stay in Iraq where he felt he was needed. Once back in the U.S., even with the disabilities and troubles he experienced, he went on to obtain a masters degree. Not only that, he was involved in public speaking including appearances all over the place while dealing with grief, anger, anxiety, sorrow and a host of other emotions. I was amazed with his bravery and fell in love with the relationship between Luis and Tuesday. The work that Tuesday put in for Luis is remarkable. He never left his side. It was as if they were healing each other. Overall, this is one of the best books I’ve read in 2017. It’s written well and kept me engaged from beginning to end. I thoroughly enjoyed looking at all the pictures in the back. It was nice to see Mary, Rick, Lu Picard (founder and director of ECAD where Tuesday was trained), and some of the pictures of Luis while in Iraq. Luis was someone willing to give everything he had for his country and sacrificed everything. I’m glad that I read it and I’m reading Tuesday’s Promise next. I’m not sure why, but at around 72% of the book I decided to check out his author page again because it seemed like a fairly active page when I’d first looked at it. I wanted to see what he was doing now being that another book was just released in 2017. I happened to notice up at the top by his name that he had passed away in December 2016 at the age of 43. I was shocked and saddened and had to find out why. It turns out that he left Tuesday with some friends and committed suicide. He was found in his hotel room with drugs in his system. I just couldn’t get over the tragedy. I instantly thought of Tuesday. He had to let go of others before, but all I could think about was how bad this must’ve been for him and wonder how he’s doing now. I did read that Tuesday’s being cared for by loved ones. You must read this book. Not because you're a dog lover. Not because you are or were in the military. Not because you love someone who is or was in the military. Those are all good reasons, but they're not the real reason. You must read this book to know about love, to know about pain, and about recovery. And you need to know about hope. This book tells not only the remarkable story of Montalván and his service dog Tuesday, it tells the story of a war that we citizens, through action and inactio You must read this book. Not because you're a dog lover. Not because you are or were in the military. Not because you love someone who is or was in the military. Those are all good reasons, but they're not the real reason. You must read this book to know about love, to know about pain, and about recovery. And you need to know about hope. This book tells not only the remarkable story of Montalván and his service dog Tuesday, it tells the story of a war that we citizens, through action and inaction, asked our men and women in uniform to fight. Our country asked them to fight it, while the politicians played football with the funding and the strategies. It's hard to read about the stress that our service men and women put up with while they're fighting and the challenges they face as they re-integrate into civilian life. In clear yet painful terms, Montalván provides the best description I've seen of what PTSD is, and how debilitating it can be. Note: was sadden to read on another Goodread's review that Luis Carlos Montalván committed suicide in December 2016. May God bless his soul. I highly recommend reading this book. It is a book about HOPE, encouragement and informative, while also being a heart warming story about Tuesday, a golden retriever, and the wounded warrior he saved. I have PTSD and started reading this book as I was begining the 12 week intense exposure therapy treatment at a VA Medical Center. It provided hope and encouragement for me then as well as now. It also provides hope and encouragement for the loved ones of vets suffering with Post Tramatic Stress Di I highly recommend reading this book. It is a book about HOPE, encouragement and informative, while also being a heart warming story about Tuesday, a golden retriever, and the wounded warrior he saved. I have PTSD and started reading this book as I was begining the 12 week intense exposure therapy treatment at a VA Medical Center. It provided hope and encouragement for me then as well as now. It also provides hope and encouragement for the loved ones of vets suffering with Post Tramatic Stress Disorder (PTSD) Tramatic Brain Injury (TBI) and other disabilities. It will give you a look into the lives of those who suffer with the invisible wounds, PTSD & TBI as well as other disabilities and the challenges that we face each day. There is also a look into one organization, ECAD, that is dedicated to helping vets. As those who I have lent my copy to say it is a good book to read, a real eye opener. This story was not what I expected. I was looking for a good dog story, and I got that, however it came with the remembrance of military life and two tours in Iraq. This story covers a period of time that my own grandson was also in the Army, in Baghdad, at the same time as Captain Montalvan. Almost quitting this novel at that point, I trudged on. And I am happy that I did. A colleague of mine not only recommended this book, but gave me her copy and asked that I "pay it foreword" when finished reading it. After plowing through the first couple of chapters, I understood why she wanted me to read it. As a veteran myself, I needed to read this story. Until Tuesday is not a typical memoir or a non-fictional account about a battle weary disabled veteran and his service dog. Until Tuesday is a refreshing and thoroughly honest story of tragedy turned to triumph when fate i A colleague of mine not only recommended this book, but gave me her copy and asked that I "pay it foreword" when finished reading it. After plowing through the first couple of chapters, I understood why she wanted me to read it. As a veteran myself, I needed to read this story. Until Tuesday is not a typical memoir or a non-fictional account about a battle weary disabled veteran and his service dog. Until Tuesday is a refreshing and thoroughly honest story of tragedy turned to triumph when fate intercedes. I can almost guarantee It will bring readers to tears. Captain Montalvan deployed for two combat tours in Iraq as an Army Officer in the most challenging circumstances. In this amazingly well crafted account, Montalvan's style is detailed and representative of the best in journalistic style. His story and the story of his service dog, Tuesday is woven together in a gripping tale that kept me reading. I enjoyed this book because the author candidly spreads his personal experiences of learning to cope with Post Traumatic Stress - PTSD before the world to read about and assess as they may. The invisible wounds experienced by so many of America's best and bravest are unfortunately misunderstood by the broader population. From his personal experiences, Montalvan provides a clear and unblemished picture of the how, what, and why PTSD is such a challenge for those who must learn to cope with it and those who desire to assist with the process of healing. The role service animals play in treating invisible wounds is a big part of this story and Tuesday is the star Golden Retriever on center stage. It took me a little time to think about what I wanted to say for this review. For starters, this book is a must read for everyone! This hits on so many emotions in one book. Luis and Tuesday struggle through life separately, but, in time, learn to believe in, and trust each other, thus easing each others pain and fears. Together, they are as one, and have been rewarded with the amazing ability to not just survive, but to live. Anyone who has the opportunity and pleasure of reading this story, wi It took me a little time to think about what I wanted to say for this review. For starters, this book is a must read for everyone! This hits on so many emotions in one book. Luis and Tuesday struggle through life separately, but, in time, learn to believe in, and trust each other, thus easing each others pain and fears. Together, they are as one, and have been rewarded with the amazing ability to not just survive, but to live. Anyone who has the opportunity and pleasure of reading this story, will come out at 'THE END' a little differently than when one started. At least I did. A very eye opening, heartwarming, thought provoking testament to the ability to heal even the most difficult wounds. The wounds of traumatic brain injuries that no one else can see, no matter the cause, are quite often the most debilitating and disabling. And, unfortunately, without help, they are very often fatal, in the end. Thank you, Luis and Tuesday, for bearing your pain for all the world to see. In return, you've given the the world the ability to see what we can not see. I believe it will make a profound difference in the world. I hope everyone reads this book! Until Tuesday is a book for dog lovers, PTSD sufferers, people with other invisible illnesses and those with a loved one who are currently fighting in a war or have been to war. Luis tells it like it is with brutal honesty and no sugar coating. I cried and laughed and identified with Luis in his struggle in day to day life and the loneliness and the lack of understanding that comes with invisible illness. Until Tuesday is not a book that leaves you depressed and wishing you had never read it. It Until Tuesday is a book for dog lovers, PTSD sufferers, people with other invisible illnesses and those with a loved one who are currently fighting in a war or have been to war. Luis tells it like it is with brutal honesty and no sugar coating. I cried and laughed and identified with Luis in his struggle in day to day life and the loneliness and the lack of understanding that comes with invisible illness. Until Tuesday is not a book that leaves you depressed and wishing you had never read it. It leaves you happy, filled with hope, inspired to help others and in awe of the human spirit and the unselfish love of a dog through hell and happiness. What an inspiring, heartwrenching, moving, lovable book! I felt so incredibly sorry for Luis, and in turn for all the soldiers who have and are fighting for their countries...the veterans of Iran, Afghanistan and all other places that have ever been at war. Captain Luis Montalvan retired from 17 years of service in the US army, and he was suffering from physical disabilities, plus PTSD (post traumatic stress disorder). After a horror period, where the simple things we take for granted - taking a What an inspiring, heartwrenching, moving, lovable book! I felt so incredibly sorry for Luis, and in turn for all the soldiers who have and are fighting for their countries...the veterans of Iran, Afghanistan and all other places that have ever been at war. Captain Luis Montalvan retired from 17 years of service in the US army, and he was suffering from physical disabilities, plus PTSD (post traumatic stress disorder). After a horror period, where the simple things we take for granted - taking a bus, walking to a supermarket or cafe - caused him so much terror that he barely left his apartment, and existed on alcohol to survive, Luis was assessed, and given a service dog, Tuesday. When I put my hand on his head, he stepped on to the couch and raised his face to my own. We stared at each other for a few seconds and then, slowly, Tuesday licked me. Yes, on the lips...and the chin...and the nose...slobbering all over my face with that big slow-moving tongue. That's the moment when Tuesday, after all his caution, stopped being just my service dog, and my emotional support, and my conversation piece. That's when he became my friend. I felt as if this author spoke personally to me. I am a retired Deputy Sheriff, diagnosed with PTSD. I cried and laughed when I read this very special book. I have several rescue dogs and feel the connection that Luis mentions in his book. This book literally saved me from myself. I do not feel alone anymore. Thank you for your honesty, love and bravery. This story, this man, this dog....without meaning to touch me specifically, opened my heart to start my healing journey. Thoughtful, intelligent, interesting, funny, heartbreaking....educational! No matter where you are in your life journey, there is something in this beautifully expressed book for everyone who feels love, pain and hope! Thank you Captain Montalvan for sharing your life and your Tuesday! One amazing book!!! I am an army wife and my husband doesn't talk much to me about the war so this has helped me understand him and his thoughts in a way. I respect Luis to the fullest and admire him greatly!! Tuesday is one lucky dog!! I had heard about Mr. Montalván's story and knew his book would be a really good read. I'm a big dog lover and have the greatest respect for those that serve our country. Quite honestly after reading Until Tuesday, I don't know if I've ever read anything more touching. This story isn't your typical "feel good" story. It completely opened up my eyes to some of the struggles and difficulties Veterans, Service Members and people with disabilities are facing and have faced. I've always been aware of I had heard about Mr. Montalván's story and knew his book would be a really good read. I'm a big dog lover and have the greatest respect for those that serve our country. Quite honestly after reading Until Tuesday, I don't know if I've ever read anything more touching. This story isn't your typical "feel good" story. It completely opened up my eyes to some of the struggles and difficulties Veterans, Service Members and people with disabilities are facing and have faced. I've always been aware of PTSD, depression and other struggles our military heroes face, but Mr. Montalván made it seem more real. The book initially takes you through Tuesday's early years and training. Tuesday actually lived in a prison as part of a program called Puppies Behind Bars and also spent time with troubled kids. I don't think Tuesday really found himself though until he met Mr. Montalván. It's almost as if they were meant to be paired with each other by divine intervention, and we are all better for it. I know that may sound a bit corny, but I really do believe it. The book then really dives into Mr. Montalván's story, notably his time in Iraq. I don't want to give too much away, but he describes vividly and candidly what he experienced there. Working in an area near Syria where many people have bad intentions involving our troops, this man was putting his life on the line daily. Unfortunately one day Mr. Montalván was ambushed and injured. This event would change his life forever because the injuries were both physical and psychological in nature. Incredibly he would go on to serve a second tour of duty in Iraq after this attack. No punches are pulled as he gives his honest opinion about how the military campaign was planned, executed, and how it was told through the media. Mr. Montalván would eventually receive an honorable discharge, but it seemed as if his life was heading in a downward spiral. He was home facing a number of personal difficulties and battle wounds, physical and mental. Next comes the truly special and touching part of the book. Mr. Montalván is paired with Tuesday after hearing of a program for Veterans and Service Dogs. I would describe he and Tuesday as both being a bit broken at that point, but I think they healed each other pretty quickly. You will find yourself rooting for them both while reading. If you don't I'm not sure you have a pulse. I think what ensued was a training and bonding of each other. Not just a man and his dog, but two friends. There are still some bumps in the road (such as people questioning Mr. Montalván's need for a Service Dog), but after Tuesday comes into his life things take a heartwarming turn. I'm grateful to Mr. Montalván for a few reasons. Obviously he served this country and wrote a great book. Also, I became much more informed as a result of reading the book. Not just about what transpired in Iraq, but I think more importantly what was (and is) going on with our Service Members and Veterans. Too many are facing difficulties, only to be turned away when they seek or need help. They deserve so much better. This is a very sweet and touching story of a Iraq veteran and his service dog, Tuesday. And don't worry animal lovers, Tuesday is still alive - I believe he's about five years old today - and still with the author, Luis. This book really opened my eyes to the trauma that soldiers experience during war and how abandoned they are by society, political leaders, and even their families. Luis's story is not told to earn pity, but to help people understand that what you see and hear in the papers or f This is a very sweet and touching story of a Iraq veteran and his service dog, Tuesday. And don't worry animal lovers, Tuesday is still alive - I believe he's about five years old today - and still with the author, Luis. This book really opened my eyes to the trauma that soldiers experience during war and how abandoned they are by society, political leaders, and even their families. Luis's story is not told to earn pity, but to help people understand that what you see and hear in the papers or from the pentagon is not an accurate reflection of the situation on the ground in a war zone. It's also told to make people realize how truly life saving these dogs are - from the prisoners who help with their training and finally have a real connection in life, to the veterans and disabled people whose lives they completely change. He has a wonderful quote in there that really helped me get a feel for what PTSD is - "the closer you are to death's presence, the more you feel life's pulse.' This quote sums up how soldiers' continually live in a state of fight or flight, and that a prolonged amount of time in that state is impossible to leave behind. Eventually, everything is perceived to be a threat. Until Tuesday starts out as the memoir of a service dog and the wounded veteran he saves and then turns into so much more. The story of how Tuesday and Luis found each other is a remarkable one, but the stories of why they came to need each other so much are heartbreaking and inspiring. Luis tells in compassionate detail what he experienced in Iraq and gives a courageous description of what living with PTSD is really like. He details the commitment involved in training and placing a service dog, Until Tuesday starts out as the memoir of a service dog and the wounded veteran he saves and then turns into so much more. The story of how Tuesday and Luis found each other is a remarkable one, but the stories of why they came to need each other so much are heartbreaking and inspiring. Luis tells in compassionate detail what he experienced in Iraq and gives a courageous description of what living with PTSD is really like. He details the commitment involved in training and placing a service dog, examines the policy decisions that are hurting our troops and our success in Iraq, brings to light discrimination against the disabled in our own country, and yet never invites pity, but rather inspires admiration for the amazing things he has accomplished. I can't help it, I'm going to have to rave about how good this book is! While I love a good dog book and Tuesday's face on the cover of this one is hard to resist, this book surpasses the generally warm, fuzzzy, sweet tales you normally find. I never would have picked up a book about the war in Iraq or about soldiers dealing with PTSD, but I am so grateful for the education Until Tuesday has given me on these subjects. Luis Carlos Montalvan is a true leader and his story will make you look at life in a whole new way. I started reading this book just when those a-holes in Yulin, China were murdering hundreds of dogs. That place is an abomination. This is an amazing memoir full of honesty from a physically and psychologically wounded Iraq War veteran and the service dog that helped him heal from his head injury and the effects of Post-Traumatic Stress Disorder (PTSD). The author shares his experiences in the Iraq War: the violence, the corruption, but also rays of sunshine and hope like the honest and competent I started reading this book just when those a-holes in Yulin, China were murdering hundreds of dogs. That place is an abomination. This is an amazing memoir full of honesty from a physically and psychologically wounded Iraq War veteran and the service dog that helped him heal from his head injury and the effects of Post-Traumatic Stress Disorder (PTSD). The author shares his experiences in the Iraq War: the violence, the corruption, but also rays of sunshine and hope like the honest and competent Iraqi soldiers and staff he worked with. Montalvan also provides details of the place where his dog Tuesday came from, a unique NGO named ECAD that trains service dogs for persons with special needs and disabilities. This isn't your typical "dog book" despite first impressions of the cover picture of a handsome golden retriever. It is the story, primarily, of an army vet. And you will cry when you read it. No, the dog doesn't die at the end (thankfully, unlike some other popular dog-on-the-cover books), but you will find yourself tearing up several times during the book. If you want a deeper understanding of what it means to be a soldier (even if you thought you knew) you must read this book. Montalvan provid This isn't your typical "dog book" despite first impressions of the cover picture of a handsome golden retriever. It is the story, primarily, of an army vet. And you will cry when you read it. No, the dog doesn't die at the end (thankfully, unlike some other popular dog-on-the-cover books), but you will find yourself tearing up several times during the book. They (Author and dog) are both my heros! Insightful...Hopeful...Impacting...Honest. A most worthy heartfelt read regarding Wounded Warriors, PTSD, and the importance of service/companion dogs, from the personal experiences and research of Luis Montalván. I've added several copies of this to my middle school library as a nonfiction option for students. The students who have read it also think it's great. It's a story not to be missed. Captain Luis Carlos Montalván, the author of the autobiography, Until Tuesday, begins his book with a preamble entitled “The First Look.” Montalván is a decorated Iraq veteran who served two tours of active duty in Iraq. He describes in detail the series of events, conflicts and stress that wore him and his unit down. We learn of the infant baby, killed in a conflict, whose body he is responsible to receive and the face of an Iraqi bomber, “shorn clean” and lying on the ground, like a mask; the eyebrows, nose, lips and beard all in place. He describes the failed assassination attempt on his life, a result of his dedication to help the Iraqi people he was charged to protect. The combination of being on constant alert, the horror and shock of the assassination attempt, the carnage he witnessed from suicide bombers, sniper attacks and the conflict of battles, and the loss of trust he felt after repeatedly being let down by the Army culminated into a severe case of PTSD. PTDS is not a telling wound. It is well hidden, most outsiders not being able to tell that anything is wrong. It is also a wound that is only at the beginning stages of being understood by those who do not have it as well as those who do. One of the biggest thinking errors surrounding PTSD is that the person is “faking” their emotional distress, or worse that PTSD is temporary and the person just needs to “snap out of it” and get moving forward. It is that ignorance and misunderstanding that leads to the majority of discrimination. *** RIP Luis Carlos Montalván (December 5, 2016) - at 43, too young. Powerful stuff. But where to start? The nation needs to read more about PTSD (post traumatic stress disorder), and this is one of the better books I've read in that category, but more on that later)... Dog lovers, yes, you'll love this book. If the opening sequences from Edgar Sawtelle captivated you, this is right up your alley. And my guess is this one will polarize veterans, active duty military, military historians, and nati *** RIP Luis Carlos Montalván (December 5, 2016) - at 43, too young. The story itself is remarkable. Another (and yes, there are too many) incredibly talented, motivated, dedicated American came back from Iraq (or Afghanistan) badly damaged (and, sadly, disillusioned). Despite his service and sacrifice, our government, military, health care system, society, and (alas, initially) his family let him (like so many others) down. (Personally, I found this a fitting companion, and a logical follow on, to the excellent piece on PTSD, TBI, and suicide Thank You For Your Service. As an aside, I was intrigued that Montalvan treads surprisingly lightly on the suicide topic, consigning it to a small number of surprisingly poignant footnotes, which I hope readers don't gloss over.) Fortunately, he was lucky enough to be paired with a remarkably trained service dog (the product of a remarkable group of unheralded and unappreciated trainers and facilitators), which altered the trajectory of his recovery. If the word remarkable appears repetitious here, well, read the book - you'll understand. This book kept me in a constant state of heartbreak and support for the author and love for Tuesday. It may take a dog lover to enjoy it as much as I did, but really anyone should appreciate the suffering our veterans with PTSD must endure. It is well-written, perhaps a little repetitious at times, but that is necessary to convey the horrors that are part of PTSD and the wonder of the evolving partnership between human and service dog. The messages are powerful and compelling. As the daughter of This book kept me in a constant state of heartbreak and support for the author and love for Tuesday. It may take a dog lover to enjoy it as much as I did, but really anyone should appreciate the suffering our veterans with PTSD must endure. It is well-written, perhaps a little repetitious at times, but that is necessary to convey the horrors that are part of PTSD and the wonder of the evolving partnership between human and service dog. The messages are powerful and compelling. As the daughter of a World War II veteran (and career military) and the wife of a Viet Nam veteran I have had a fascination for books about the wars and certainly am familiar with atrocities, but this was my first exposure to the horrors of Iraq and the permanent damage it has caused to many of those who served there. I kept wondering how many thousands of veterans there are who are not receiving helpful treatment and how many could benefit from a service dog. For both my husband and myself it has solidified our commitment to the Wounded Warrior Project. As a chronic, addicted volunteer it is causing me to search in potential volunteer areas I had never before considered. This book has stayed with me for several days now since I finished it, and I have been talking about it every chance I get. (The first question all my animal-loving friends ask is whether it is sad--as whether the dog dies in the end. And the answer to that is no.) I originally bought it on Audible but am thinking about buying a hard copy to go back to and reread, as well as show the people I talk to. The front cover photo is a great hook! 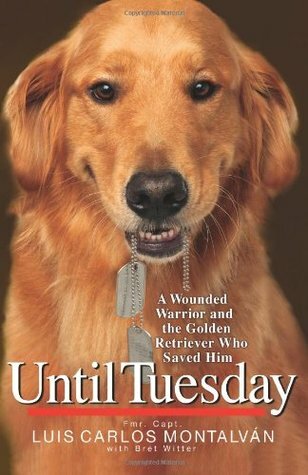 Combining a heart- breaking story of a wounded American Army captain, plagued with war- related injuries & PTSD, and a wonderful young retriever named Tuesday- this is a book I couldn't put down. If you want to better understand the struggles of our Iraq/ Afghanistan military veterans: Luis' journey from gung-ho soldier to disabled vet, living on his own in loneliness & constant anxiety, certainly brings our soldiers' post- war challenges into sharp focus. The writers skillfully tell the Combining a heart- breaking story of a wounded American Army captain, plagued with war- related injuries & PTSD, and a wonderful young retriever named Tuesday- this is a book I couldn't put down. If you want to better understand the struggles of our Iraq/ Afghanistan military veterans: Luis' journey from gung-ho soldier to disabled vet, living on his own in loneliness & constant anxiety, certainly brings our soldiers' post- war challenges into sharp focus. The writers skillfully tell the progression of both man and dog , weaving in military history and Army life details at an understandable level, and do the same with the early life and incredibly thorough dog training Tuesday receives. While Luis' ups and downs are predicated on some horrible and dangerous events during his tours of duty in Iraq, the story never becomes a traumatic descent into one vet's struggle to survive- every chapter is suffused with the deep affection Luis feels for Tuesday, and the parallel story of their coming together. The sheer joy of Tuesday's personality and complete devotion to Luis helps lift the telling from just a recovering soldier's somber, bitter realities - to a story of love and friendship. I finished it in one sitting, at turns grieving for the mess called the Iraq war and Luis' life altering experiences, or sharing his indignation with our American society which remains so indifferent to disabled folks' everyday struggles, or marveling at the growing partnership - then love story between Tuesday and Luis. We would all be so lucky to have a beautiful dog like Tuesday in our lives! Brutally honest and ruthlessly unapologetic, Montalvan recounts many of the combat experiences that haunt him still. Driven to find a way out of hopelessness and despair, he is introduced to his amazing service dog, Tuesday, who has been through his own version of hell. Extremely informative, Montalvan's writing draws the reader into his existence where one cannot help but applaud both man and dog for what each has become for the other. This is one of those books that brings each reader the inverse of what the reader brings to the book. The book's heroes are studies in contradictory existence - the young man, inspired by Reagan patriotism to eschew his father's intellectualism and academia and enlist in the Army at 17, who becomes a leader of men at war and a passionate and reasoned advocate against bad decision-making after the war; the golden retriever, trained from his third day of life to serve one person stoically and beco This is one of those books that brings each reader the inverse of what the reader brings to the book. The book's heroes are studies in contradictory existence - the young man, inspired by Reagan patriotism to eschew his father's intellectualism and academia and enlist in the Army at 17, who becomes a leader of men at war and a passionate and reasoned advocate against bad decision-making after the war; the golden retriever, trained from his third day of life to serve one person stoically and become attached to nobody, who suffers attachment and abandonment repeatedly until the right combination of people with nothing left to lose met a dog who wants only to serve - when finally, a wounded veteran and a "broken" service dog meet and realize that they were both broken in complementary ways, only to fit each other perfectly. Readers with preconceived notions of the war and its justness will find intellectual challenges - this book is neither pro-war nor anti-war generally. Rather, it is about a veteran whose war and post-war experience has become a difficult example of how we treat veterans; is is about how Tuesday, a dog whose only mission is to serve but who has, despite his training, retained every element of his distinct and ebullient personality, has helped this leader of soldiers adapt to a post-war life despite the author's traumatic injuries and a profound difficulty re-integrating into society. Through personal stories, the author shines a bright light on what life as a returning wounded veteran is like and how, when those wounds aren't readily evident to the uneducated observer, existence in society can be made even more difficult. Animal lovers will connect personally to the story of Tuesday as he progresses through his training and the inside glimpse of how a service dog is made is enlightening, touching and, at times, saddening. Veterans, soldiers and their families, friends and loved ones will connect to and recognize much of Luis Montalvan's personal story - either from direct experience or through that of friends and colleagues. For those not directly connected to either of these groups, this book should elevate the dialogue regarding how America treats its returning veterans while still being a touching and compelling story. Most profoundly, this books shows how soldiers do not return from war the same as when they left; they are changed, permanently, inexorably, inescapably. For some, it is a neutral change; for others, it is a change for the worse. It is in trying to fit into the life they left as the person they were when they left that such difficulties arise for returning soldiers and their families, and that these adjustments exist on all sides - the returning veteran; his family and friends; the random bus driver who doesn't understand that there are different types of service dogs because nobody has ever educated her to understand this and, finally, the service dog himself. LUIS CARLOS MONTALVÁN is an award-winning New York Times bestselling author, speaker, and advocate. TUESDAY is Montalván's beloved service dog and the recipient of the American Kennel Club (AKC) Humane Fund Award for Canine Excellence (ACE) - Service Dog. A 17-year veteran of the U.S. Army, Captain Montalván served multiple tours abroad and was decorated with numerous awards including two Bronze St LUIS CARLOS MONTALVÁN is an award-winning New York Times bestselling author, speaker, and advocate. TUESDAY is Montalván's beloved service dog and the recipient of the American Kennel Club (AKC) Humane Fund Award for Canine Excellence (ACE) - Service Dog. A 17-year veteran of the U.S. Army, Captain Montalván served multiple tours abroad and was decorated with numerous awards including two Bronze Stars, the Purple Heart, the Army Commendation Medal for Valor, and the Combat Action Badge. In 2007, Capt. Montalván honorably departed the military and in 2010 completed a master's of science from Columbia University's Graduate School of Journalism. Recently, Montalván's inspirational memoir won the 2012 USA Best Book Award in the Autobiography/Memoir & Audiobook Non-fiction categories. He was a finalist for a 2012 APA Audie Award beside four other nominees including Tina Fey and Michael Moore. Until Tuesday was also a 2012 International Latino Book Awards finalist. Luis is the recipient of a 2011 Voice Award and the 2011 Invisible Hero Honors Award for his efforts to educate the public about trauma and the real experiences of veterans and people with disabilities. Montalván is a vocal advocate. His work has been published in outlets including The New York Times, Washington Post, San Francisco Chronicle and Military Review, and regularly appears on local, national, and global media. Among the outlets that he and Tuesday have been featured on are NPR, CNN, National Geographic and The Late Show with David Letterman. Tuesday Tucks Me In, their first children's book (Macmillan), was selected by Amazon.com as the "Best Nonfiction Children's Book of 2014." Most recently, the Children's Book Council (CBC) and the National Council for the Social Studies (NCSS) selected Tuesday Tucks Me In a "2015 Notable Social Studies Trade Book for Young People." Luis & Tuesday frequently lecture and offer dynamic programs about their work and are advocating extensively during travel this year.